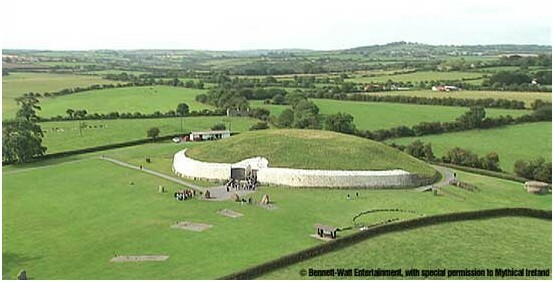 Above picture shows Newgrange, which is one of the best examples in Ireland and in Western Europe, of a type of monument known to archaeologists as a passage-grave or passage-tomb. It was constructed around 3200BC, according to the most reliable Carbon 14 dates available from archaeology. This makes it more than 600 years older than the Giza Pyramids in Egypt, and 1,000 years more ancient than Stonehenge. Surrounded by a stone circle (12 remaining from an estimated original 36), with 97 Kerb-stones, an internal cruciform chamber and corbelled roof, the grandiose scale of the earth-works at Newgrange make it one of the most spectacular of prehistoric monuments in all Europe. The recognition that it provides an accurate means of measuring the solar year (to within a margin of several minutes), is testimony to the prehistoric mind. As the Bronze Age in Ireland drew to a close, there appeared in Ireland a new cultural influence. Developing in the Alps of central Europe, the Celts spread their culture across modern-day Germany and France and into the Balkans as far as Turkey. Within a few hundred years, Ireland’s Bronze Age culture had all but disappeared, and Celtic culture was in place across the entire island. The Celts had one major advantage – they had discovered Iron. Iron had been introduced to the Celtic peoples in Europe around 1000 to 700BC, thus giving them the technological edge to spread as they did. Iron was a far superior metal to bronze, being stronger and more durable. On the other hand, it required much hotter fires to extract it from its ore and so it took a fair degree of skill to use iron. None of this is to be taken to mean that bronze fell out of use. Rather, iron simply became an alternative metal and many bronze objects have been found that were made in the Iron Age. Iron brought a new era of man’s capabilities within our island. Only a very superficial layer of soil was used for the growing of food. This resulted in both leaching and erosion of the top soil from the sloping hills where most people resided. The valleys were still dominated by huge trees, which the people had not the facility to cut down nor to remove the huge roots. Ireland’s wet climate particularly in the western part exacerbated both erosion and leaching. The soils became more acid, nutrients such as phosphorus became unavailable to the crops. Hence the people moved from one place to new land. The iron implements were stronger than the bronze age ones and the type of implement was also developed in mainland and brought in by the continuing immigration of mainland European Celts. The ax, the pick-ax, and even a basic wooden plough with an iron share coulter were reputed to have been put to use. However, progress must have been counted in hundreds of years – not like now when it is in hundreds of hours. The iron wore very fast while the wooden part was vulnerable and I am sure that the plough that was pulled by animals did not survive for long on the rocky lands of Ireland. It was not until steel was made available for farm implements that great progress was made in this regard and this did not happen until we got into the 18th century. On the sandy soils or in stone free soils it was different. However the manual iron implements must have played a greater part. They were able to penetrate deeper-down in the soil and new fertile layer of soil was producing increased yields. However as population rose ‘empty’ land to move on to must have become increasingly difficult. In the words of Frank Mitchel in his book “The Irish Landscape” ‘The farming of the Dowris Period that opened with a bang with the introduction of the ‘ard’ (hill farm) ended with a whimper as infertile heaths extended widely’. The simple type of homestead of the lowest rank of ‘free’ farmer was the ‘rath’ or ringforth. It is also known by other names as lios, caher, or cashel and occasionally as dun. Cashel and lios are applied to stone structures. Rath and lios are applied to example made principally of piled earth, although many may have stone faced banks. It is still the commonest monument on the Irish countryside. Below one can see aerial pictures ringforts/ raths at Ballincollig, Co. Cork – ref Archaeological Inventory of Co. Cork Vol. 11. 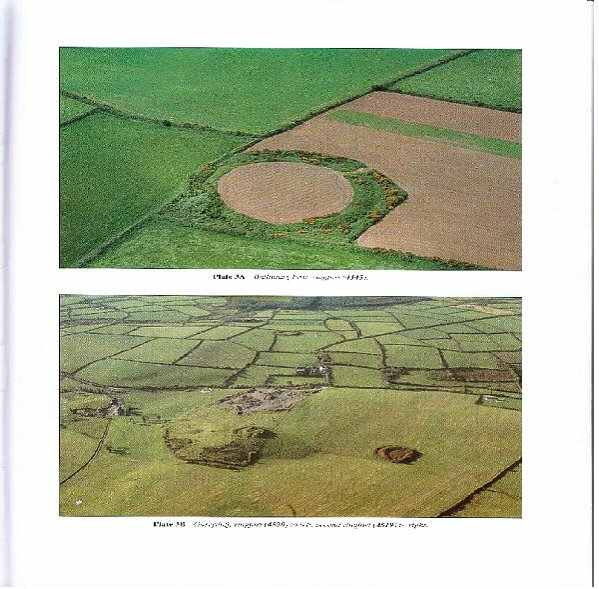 Aerial pictures ringforts/raths at Ballincollig, Co. Cork – ref Archaeological Inventory of Co. Cork Vol. 11. Not all raths will have been occupied at one time. Although they often called ring-forts, they are not forts, if we mean a strong point capable of resisting siege for some time. Raths rarely had a well and offered little difficulty to a determined attack. Within the raths was an open space, the lis, where livestock could be penned in time of an emergency, and there were also houses and small farm buildings. The farmer and his family lived in the house while the servants lived in huts propped against the inside of the bank. The Chief of the clan normally lived in a ‘cranog’ which would often be a rath built on a island for security reasons. The Gaels were the last group of Celts who colonized Ireland. When the Gaels arrived, they divided Ireland into five or more kingdoms. The Romans referred to Ireland as Hibernia or Scotia.) In 100 AD Ptolemy recorded Ireland’s geography and tribes; native Celt records are of Irish poetry, myth, and archaeology. A High King ruled over the Irish provinces. Each one of these provinces had their own king who was, in name at least, subject to the High King. (The High King held his court at Tara.) The medieval Irish had a set of judicial laws known as the Brehon Laws. This system was administered by well-trained, highly educated jurists called the Brehons. A townland was an ancient Irish measure of land. The size of a townland may be regarded as a rough guide to the quality of the land as the bigger townlands are usually found in the poorer soil areas. There are 64,000 townlands in the island of Ireland so the average townland size in Ireland is about 300 acres. In mountainous areas the townlands may be as much as 2,000 acres; on the other hand in thickly-settled lowlands they are frequently less than 100 acres, and some anomalous fragments of an acre or two are designated townlands. The study of Ireland’s 64,000 townland names shows the nuances of the old Gaelic names and the attempted Anglicising of the names by English Cartographers who in the main carried out the job. The townland names, involving so many land holdings, are legal titles, and their Gaelic names, however erroneously spelt on the Ordnance Survey maps, are fossilized in their forms. Only an [Act of the Oireachtas] can alter them. A glance at any Ordnance map will reveal the strange names that Gaelic imagination contrived and English scribes corrupted. Be that as it may, most townland names can be traced back to its origins through its name. These names were very often very descriptive of the location, its type of topography, its soil type etc. Ireland’s townland is the smallest administrative centre of administrative division (as well as being one of the oldest) in the country. All other territorial divisions are collections of townlands. According to early medieval records (ref. The Two Patricks’ by Thomas F. O’Rahilly), Bishop Palladius arrived in Ireland in 431 AD on a mission from Pope Celestine I to minister to the Irish who had already been converted to Christianity. Palladius whose second name was Patrick went to Leinster. St. Patrick was a Briton of good family captured as a youth and enslaved in Ireland, after escape Patrick returned and went to Ulster in 432 AD to save the heathens from themselves and to minister to the true believers. Other views of have been put forward of south Munster connection with the Coptic Church of either Egypt or Greece. The Ogham stone writings have been put forward as a support to this point of view. . A recent “bogbook” (collected from under 1400 years layers of peat) was discovered in the Irish Midlands in 2006. While the book is, on its own, one of the most spectacular archaeological discoveries in Europe, it held one more spectacular secret. In the final stages of its conservation fragments of papyrus, a type of reed paper probably originating in Egypt, were found in its leather binding. Speculation about the connections between early Irish traditions of ascetic monasticism and those of the Coptic Church in Egypt may have got a further boost from this discovery adds solid evidence for contact between the two regions in the eight century. Around this time place names were drawn up for the different localities around the country, which remain to the present day. Druid society collapsed as Christianity spread through Ireland. Irish Christian scholars became masters of Greek, Latin, and Christian theology. Monasteries were built and they flourished. Some believe the monks preserved Latin and Greek knowledge during the early Middle Ages. Manuscript illumination, metalworking, jewelry used during ceremonies, and sculpture were of a particularly high standard. (The Book of Kells is undoubtedly the best example of manuscript illumination in the world, and it can be viewed in Trinity College, Dublin.) Many Celtic crosses were carved anew, lengthening one leg of the cross from the original four that were equal in size in order to symbolize the Christianized cross. New crosses were also built, many having elaborate carvings depicting Biblical stories. Both Celtic and Christian, these crosses cover Ireland. Farmers, wealthy enough to devote some resources to intricate gold and silver ornaments, sophisticated enough to have lawyers (brehons) and poets (filidh) as well as the druids who practised magic and offered sacrifices to the pagan gods. Kings and chieftains were the only people to have horses. At one stage warriors had used horses and chariot in battle, but by the time the Vikings arrived, chariots were only used to impress the common people. Whatever the truth of how Christianity came to Ireland, on the one hand through the Coptic Church of Egypt or through St. Patrick from Scotland, or Palladius it provided not merely a religion but also a written language, Latin. A tradition of story-telling had preserved accounts of great events, tribal histories and genealogies. Now there were scholars who recorded this material on vellum manuscripts, no doubt amending and embroidering it as they blended fact and legend. Such laborious work was aided by the spread of monasteries, often on isolated islands or mountains, where monks lived austerely and could pursue their studies free from the demands placed on conventional priests. No wonder it became known as the island of saints and scholars. The Christian monks had established monastic schools such as Clonmacnoise that were famous throughout Europe. Saint Aidan has been commonly recognised for re-converting the English people to Christianity in the 7th century. These monastic centres were the nearest thing the Irish had to towns. Outside of these, the rest of the population lived totally pastoral lives of herding, farming and hunting. Ireland was so rich in natural resources and a small population, that they did not needed to exploit the sea in the way the Vikings did. A picture of the ruin of clonamacnoise. Clonmacnoise (Irish: Cluain Mhic Nois, “meadow of the sons of Nos”) is a monastic site overlooking the River Shannon in County Offaly. The extensive ruins include a cathedral, castle, round tower, numerous churches, two important high crosses, and a large collection of early Christian grave slabs (the last two on display in the excellent site museum). Clonmacnoise was founded in 548 by St. Ciaran, the son of a master craftsman. The settlement soon became a major center of religion, learning, trade, craftsmanship and politics, thanks in large part to its position at the major crossroads of the River Shannon (flowing north-south) and the gravel ridges of the glacial eskers (running east-west). The tribal system of land tenure did not facilitate economic or technical progress in agriculture. This is perhaps where the capitalist system wins for the individual, who is promised the full benefits of the innovation when put in place. Where land is held or worked jointly, even if the individual had permission to innovate, a large part of the results would have to be shared with his fellow. Probably according the Irish Economist, Raymond Crotty, the only advantage the system possessed was that it provided an assured social status for all members of the clan and a corresponding right to a share, a large or small, in the total produce of the clan’s land. In tribal Ireland, a man’s economic position was determined by social class into which he was born. If this was high, his share in the clan’s land and its produce was large; if low, his amount was smaller, but at least everyone had some status and corresponding right to the resources of the clan. A more likely reason for holding on to the tribal system was the topography of the land, soil quality and the restrictions of farming that could be practiced particularly in the western half of Ireland. Nevertheless old stories contain many references to banquets, although these may well be greatly exaggerated and provide little insight into everyday diets. There are also many references to fulacht fiadh. These were sites for cooking deer, and consisted of holes in the ground which were filled with water. The meat was placed in the water and cooked by the introduction of hot stones. Many fulacht fiadh sites can still be identified across the island of Ireland, and some of them appear to have been in use up to the 17th century. The main meats eaten were beef, mutton and pork. Domestic poultry and geese as well as fish and shellfish were also common, as was a wide range of native berries and nuts, especially hazel. The seeds of knotgrass and goosefoot were widely consumed and may have been used to make a porridge. The Viking “Raiders” arrived on an Ireland that had rich grassland that supported many cattle, and dense forests of oak, yew and fir trees. The forests were filled with game while the lakes and rivers teemed with fish. Gold glittered in many rivers and streams. The climate, warmed by the Gulf Stream, was very mild in comparison to that of Scandinavian countries. The first major one was that of the Vikings after A.D. 793. That Viking explosion burst upon mediaeval Europe from Ireland and the Baltic to the Mediterranean and Constantinople. Scandinavia the farthest corner from the Fertile Crescent, was the last part of Europe to be transformed, being reached by agriculture only around 2,500 B.C. and by Christianity until 1000 A.D. Scandinavians became Vikings, i.e. raiders. Viking ships and sailors were fast enough compared to elsewhere in Europe and they could escape before being overtaken by the locals’ slower ships. The raids began in 793 with an attack on Linsdisfarne Island off the northeast English Coast. Thereafter, the raids continued each summer, when the seas were calmer and more conducive to sailing. Vikings from different parts of Scandinavia went raiding in different directions. Danish Vikings mainly sailed to Ireland, Scotland, England and Wales. They also settled in Normandy and Brittany. They formed the Duchy of Normandy in France. At first the Viking raiders had limited their attacks on Ireland to the monasteries in coastal areas, but with the passage of time they grew bolder. Large fleets entered the Shannon, Boyne and Erne rivers and sailed up to the interior of the island. They began raiding prosperous farmsteads, pillaging an ever-larger area. Bands of Irish warriors had traditionally gathered only for battles between tribes. When a battle was over, they went home – Ireland had no standing army. By 841 the Vikings had established a longphort, or fortified settlement at the mouth of the Liffey. This area had been known locally as Dubh Linn (Dublin) because of the colour of its water. Similar trading bases developed later at Waterford, Wexford, Cork and Limerick. Eventually these like Dublin would become towns. In the second half of the tenth century a new aggressive power emerged in Munster, through the expansion of hitherto obscure petty kingdom of East Clare, Dail Cais, whose Mathgamain captured Cashel from the Eoghanachta in 964. Shortly afterwards he defeated the Norse of Limerick at the Battle of Sulchoid and sacked the city. The description of Limerick in the O’Brien tract, Cogad Gaedel re Gallaib, gives an impression of the wealth of a Viking port town: ‘They carried off the jewels and their best property, and their saddles beautiful and foreign, their gold and their silver; their beautifully woven cloth of all colours and of all kinds. The fort and the goods town they reduced to a cloud of smoke and to red fire afterwards. The whole of the captives were collected on the hills of Saingel. Every one of them that was fit for war was killed, and every one that was fit for a slave was enslaved”. Maithgamain himself was killed in 976 but his brother Brian Boru within a few months brought all of Munster under his control. From Cashel he systematically set about building up power for himself. In the meantime, the Norse of Dublin also suffered a disastrous defeat at the battle of Tara in 980. The victor was Mael Sechnaill son of Domnall, who became king of Tara in that year. In 981 he besieged and took Dublin, carrying off a great prey from the Norse and imposing a heavy tribute on them. The Norse thereafter were reduced to playing a subordinate role in the renewed struggle for power between the rulers of the northern and southern half of Ireland. Brian Boru representing the southern dynasty of the Dail Cais went on to defeat the combined effort of Mael Sechnaill representing the northern Ui Neill along with the Dublin Norse. In 1002 Brian became king of Ireland or as he styled himself, emperor of the Irish. The Battle of Clontarf is taken as marking the end of the Viking wars, at which Brian Boru deafeated Mael Morda, King of Leinster, who had allied himself with the Dublin Norse again. Brian won the battle but died in the process. The Irish had learned from the Vikings. Their superior weapons – the heavy swords, the iron spears, the helmets and mail were now used by the Irish too. At Clontarf both sides fought with similar weapons. The Vikings in the towns were now largely Christian and were an established element in Ireland, influencing the Irish and being influenced by them. Even before Clontarf, Dublin had begun to mint coins, the first ever in Ireland. The most important influence that the Vikings had on Ireland was the transformation of a simple rural economy. With the establishment of towns Ireland ceased to be wholly rural, and the traffic of the ports opened her up to the outside world in a new way. Nevertheless the ancient Gaelic or Brehon, system of land tenure, with its characteristic political, social and legal structure prevailed throughout the countryside. The native Irish dwellers were still controlled by their Laws, Customs and Military strength. The Chiefs ruled by the Brehon Law, which meant that the land belonged to the freemen of the clan, or sept. The chief was granted the use of large estates during his life time, but these were returned to the clansmen when he died. The chief did not own the land, so it could not be confiscated if he rebelled as under English Law. The chief did not inherit his power, but was elected by the freemen of the clan. Any man from the derbfine was eligible for election. Each chief had a Brehon to administer laws, a file or poet to write his praises and to record the history of the clan, and reuctaire, or reciter, to entertain his guests. The tribal lands were divided into commonage and privately-held land, the former providing a source of revenue for the various tribal dignitaries and officials-chiefs, bards lawyers and priests-while the remainder was allocated in various proportions and on various terms to the tribal members and their dependents. As an aside, Skuldelev 2 warship has become the most famous of the Viking ships discovered in 1962 in Roskilde harbor in Denmark. 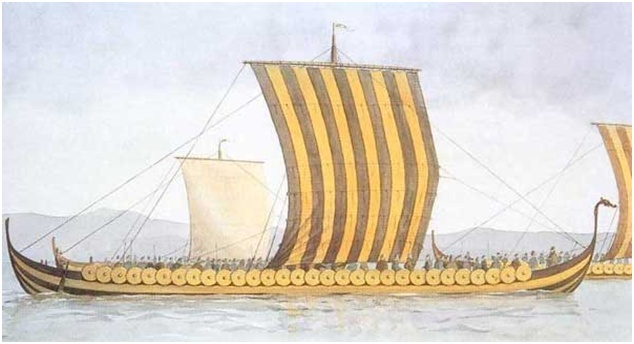 The longship was 30 meter, able to host more than 80 warriors. This is the kind of ship Danish and Norwegian Vikings used for attacks on England and France. When the wreck was found, the archaeologists thought they found two ships and they named the ships number 2 and 4. Only later they found out that it was all from one very long ship and there was no ship number 4. For this reason this ship is often named “Skuldelev 2-4”. Research has shown that the ship was built in Dublin, Ireland in the year of 1042 A.D. In 2004 The Viking Ships Museum launched a full size reconstruction of the ship by the name “The Sea Stallion from Glendalough”. In 2007 the ship did the journey back to Dublin where the original Skuldelev 2 was built.